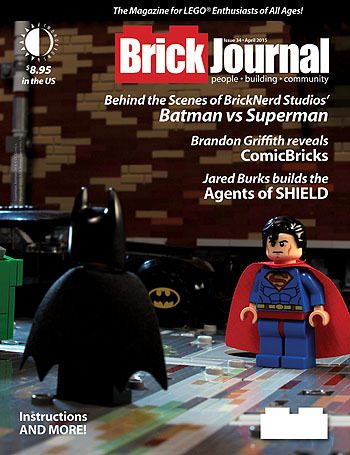 There’s tons of reasons for comics fans to check out the new issue of BrickJournal (#34, now shipping). Brandon Griffith’s COMICBRICKS project is hightlighted, as LEGO builders recreate their favorite classic comic book covers out of LEGO bricks. Jared K. Burks shows off his customized Agents of SHIELD minifigures. We go behind the scenes for the making of Tommy Williamson’s internet video Batman Vs. Superman (where a minifig of both heroes duke it out on the mean streets of Legopolis). Plus a feature on DC Comics’ recent LEGO covers, one fans attempts to modify the LEGO Friends line of girls’ toys, into custom SUPER FRIENDS heroines, building Neil Gaiman’s SANDMAN characters out of LEGO bricks, a custom set of Iron Man’s Hulkbuster armor, and more. See the preview and order a copy HERE! This entry was posted in TNT on 23 April 2015 by Mr. Morrow. 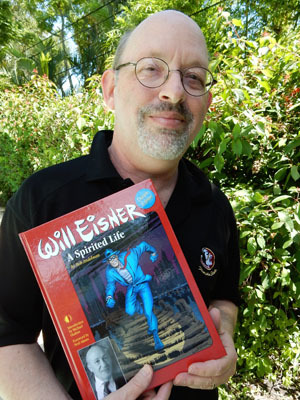 Two Eisner Awards nominations, in the same category! With so many great comics mags coming from the same company for so many years, I guess it was inevitable we’d get not one, but TWO nominations for Best Comics-Related Periodical/Journalism at the Eisner Awards. Voting for the awards is held online, and the ballot will be available soon at www.eisnervote.com. All professionals in the comic book industry are eligible to vote. The deadline for voting is June 1. The results of the voting will be announced in a gala awards ceremony on the evening of Friday, July 10 at Comic-Con International. Roy won’t be at Comic-Con this year, but I will, as will Jonny B., so if one of these wins, we’ll be covered! This entry was posted in TNT on 22 April 2015 by Mr. Morrow. Chris Samnee, Butch Guice, and more! This entry was posted in TNT on 21 April 2015 by Mr. Morrow. And now through May 1, everyone gets 40% Off BrickJournal back issues and LEGO books! Even if you can’t make it to Charlotte, NC for the LEGO event of the year, you can still save on back issues of the magazine for LEGO® enthusiasts of all ages! The sale also includes our two Minifigure Customization books, and our You Can Build It series of instruction books. So enjoy the huge savings, and we hope to see you in Charlotte NC on May 9-10 for tons of LEGO fun! This entry was posted in TNT on 20 April 2015 by Mr. Morrow. We’re making our annual trek to Wondercon this weekend, so TwoMorrows is closed till early next week. But if you can’t make it to Anaheim, California to take advantage of the sales we’re offering at Booth 1108, you can still get in on the savings! This sale is good through MIDNIGHT SUNDAY NIGHT (April 5), and does NOT include new and upcoming releases, subscriptions, or bundles. And since we’re closed for traveling through Tuesday, please be patient, as any orders placed between now and then won’t get processed until late next week. Have a great Easter and Spring Break, everyone! This entry was posted in TNT on 2 April 2015 by Mr. Morrow.